Stormzy recently stopped by BBC Radio 1 for an interview with Clara Amfo, and the conversation quickly turned to the recent Brit Awards nominations, which ignored grime in favor of pop-friendly acts like Adele and Calvin Harris. "I felt very disappointed," the MC told his host when she asked him about the snub. "I wasn't angry—it was such a great year for grime and underground music... I thought maybe this year it might get celebrated. You know when you've got that little bit of hope and that little bit of faith?" "I thought it was such a shame," Stormzy continued, "after all the great things that my peers have contributed to British music this year, that it wasn't recognized on a world stage like that. It's just a matter of breaking the doors down and carrying on, and hopefully after years, the next year or the year after, eventually we'll be recognized on that platform." 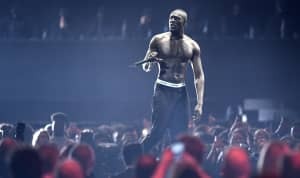 Despite the lack of accolades, Stormzy reiterated that it was "a great year for grime and a great year for all the MCs that I've had the pleasure of working with... I don't think [the Brit Awards] has any say in how great 2015 was for the genre."